Shoveling is hard enough on the back as it is. Being tall just makes it worse. That is where an extra long snow shovel for tall people can help. These are essential tools for tall people. If you are after one, you have come to the right place. 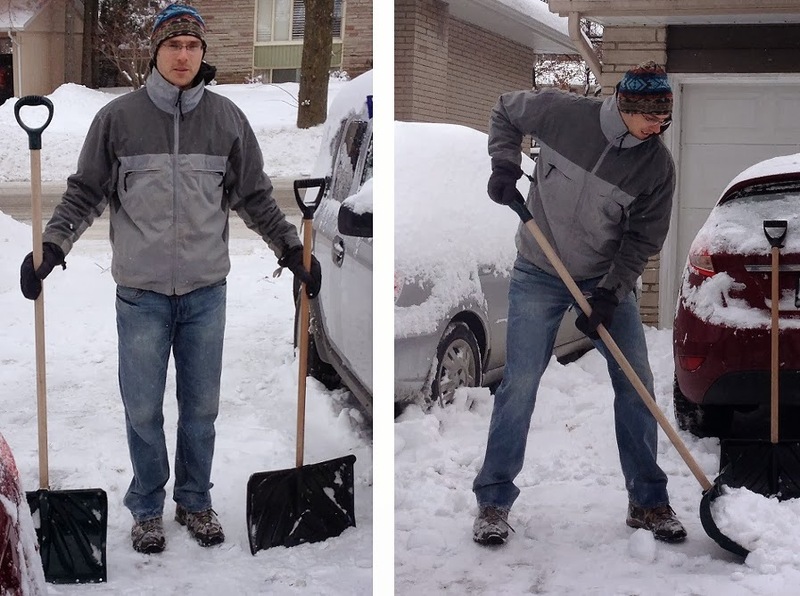 There are four basic options for improving snow shovels for tall people. You can sift through what is available off-the-shelf, get an extension, or build your own. 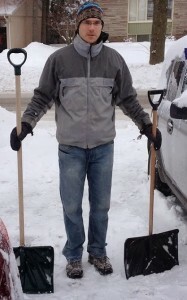 These four extra long snow shovel for tall people solutions are discussed below. Recently I discovered the Gardena Combisystem. Basically, it lets you pair various handles with various tool heads. What this means is that we tall people can take a particularly long tool handle and combine it with a snow shovel head to make an extra long snow shovel. They have 51″ and 59″ handles which should be long enough for just about anyone. 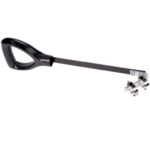 If you want longer, there is also a 63″ – 115″ telescoping handle! 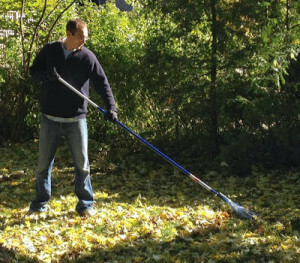 One limitation is the lack of a D-grip, which is important when shoveling. But perhaps you can take one off an old snow shovel or buy a new D-grip, like in the image link below, that hopefully will fit. I have not yet tried the Combisystem out myself, but it does look very promising. If you do try it, please let us all know in the comments below how it worked out! The longest standard snow shovel I’ve come across is in the first image link below. It is supposed to be 62″ long including the shovel head, which is about 7″ longer than your average shovel. Other than that, I haven’t come across much. What can help a bit though is using an ergonomic snow shovel. These have a handle or bend in the shaft so that the lower arm doesn’t have to reach down as far when lifting the snow. The two ergonomic snow shovels below aren’t very long, they are just there to depict ergonomic shovels. Another option to improve standard snow shovels is to attach an extension. These are becoming more popular and their are a variety of them out there. Basically, it attaches so the lower hand doesn’t have to reach down as far. Below are a couple options. You might also read the Shovelution review. Finally, the ultimate solution is extending a shovel specifically for your own height. The concept is simple; put a longer shaft on an existing shovel. You could use a variety of things for the shaft and a variety of materials (aluminum, wood, plastic, fiberglass). For my extra long snow shovel for tall people, I went with maple wood dowel from the hardware store. They had a variety of diameters and lengths to choose from. I got a 1-1/4″ diameter, 6′ length I could cut down. Some shovel heads might be better with 1″, like the one below. 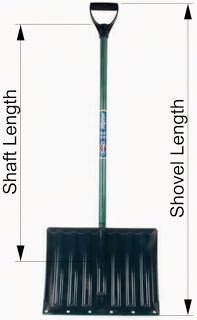 The length of the snow shovel is dependent on shovel style, your dimensions, and preferences. But on an average height person, the snow shovel handle typically comes up to about shoulder height. 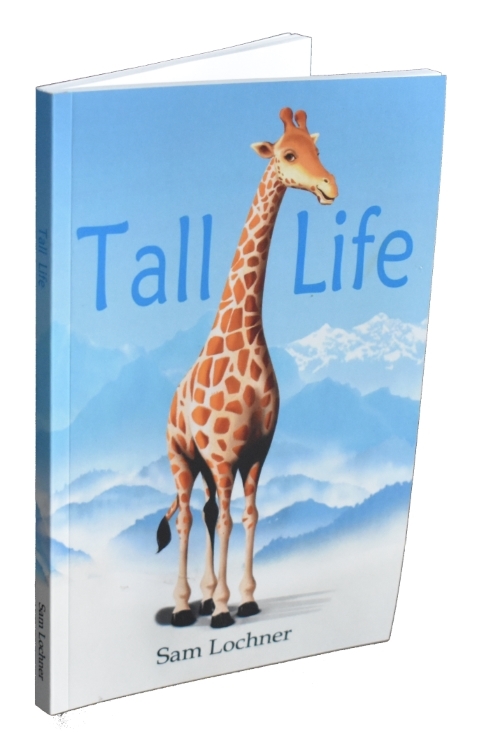 So this should be the case for taller people too. In other words, an extra long snow shovel for tall people should have a long enough shaft so that the handles comes up to about shoulder height. Another approach to finding the right size is to use the universal object size calculator. The connection between the shaft and shovel blade can be a bit tricky. I looked around and found there are three main varieties. Straight: The shaft does not taper and is fixed by only a screw(s). 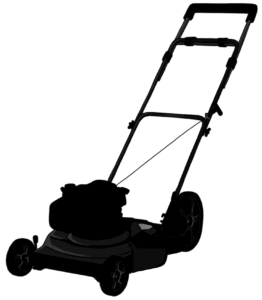 This type is usually found on cheaper shovels and is prone to coming loose. Though this type would be easy to adapt, it is perhaps too flimsy. Tapered: The shaft is tapered so that it binds against the blade’s tapered receiver and is fixed with a screw. This type would be tricky to adapt as you would need to somehow taper your shaft. Wedge: This type is a combination of the previous two. The shaft is straight, but a separate wedge is used to get a more secure connection with the blade. This is more secure than the straight type, but easier to adapt than the tapered type, hence I chose this one for my tall shovel. Adapting the wedge type: Use a couple flat head screw drivers to separate the plastic teeth and pull the shaft out of the blade. Next remove the plastic wedge from the old shaft and attach it to the new shaft. Also move the handle over to the new shaft (most handles are just straight connections with a screw). Insert the new shaft into the blade (my shaft was a bit oversize so required some sanding to get it to fit). Also make sure to rotate the shaft so that the blade and handle are lined up correctly. 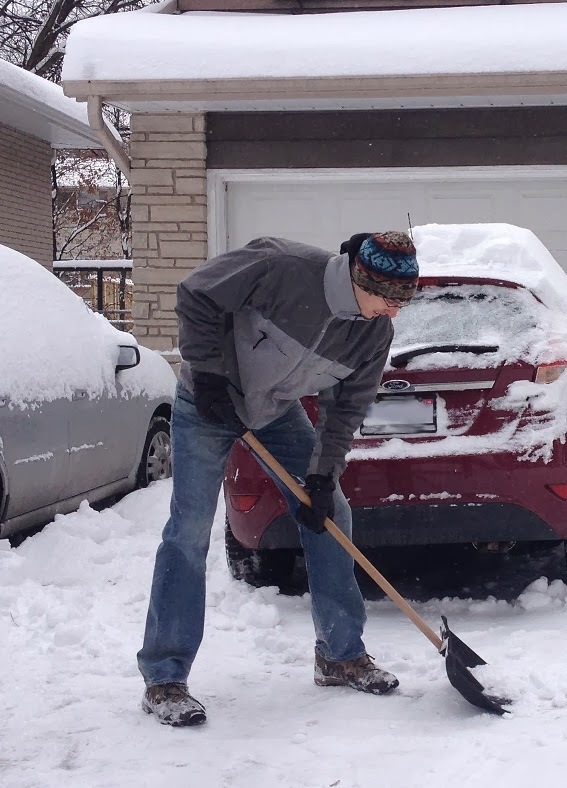 Besides allowing for you to shovel snow with better posture, another benefit of the extra long snow shovel for tall people is that you can get the blade at the angle to the pavement intended for scraping (with too short a shovel, the steep angle means continuously jerking to a stop). This is particularly important for snow shovels with a sharp metal scraper edge. After using the extra long snow shovel for tall people for a while, I can definitely say it is both easier on my back and makes me a more efficient shoveler! Any suggestions on where to buy longer shafts? I suggest first trying your local hardware stores and lumber yards. If they don't have what you want in stock, they can probably get it for you. I don't know of any off hand, but there are probably some online wood dowel suppliers that could also help you out. As far as other materials, I was thinking maybe a fiber glass or aluminum pool pole, but you might have a hard time finding the right diameter. Now I need to raise the handles on my snow blower. I live outside of south of Buffalo NY in Hamburg . We just got 80" of snow over the past 3 days. I read your post then went to Home Depot. It’s the beginning of season so they were stocked with almost a dozen different models. Found an inexpensive one to modify and went to the garden tool aisle and bought a 60″ broom stick. Because it was a cheaper shovel it had the broom-diameter stick rather than the thicker shovel-diameter stick. I’ll add the backsaver attachment you mentioned. Regarding the three varieties of connections you mentioned, I found a fourth. This model has supports like you see on a push broom. Really sturdy. And it also comes with a 48″ handle, so I doubt I’ll modify it, but I could if I wanted. Awesome! I feel like this is a must for every tall person living in a cold climate! But I haven’t got a whole lot of comments here about people trying it… So thanks for writing in, and great tip on the fourth category. I’ll have to try that some day. Going to need this, I’m 6’5″ and have been using a regular shovel. Reckon I need at least another 2′ on the end. You might want more than 2″ extra, perhaps check out the scaling for a starting point.